It's Facebook Fridays! for May 18, 2018, and we predict that you will succeed beyond your wildest dreams! The Lucky Mojo Curio Company is holding a random drawing to give away 3 stupendous Crown of Success spiritual supply prizes to open the pathway to fulfillment on every level of achievement. 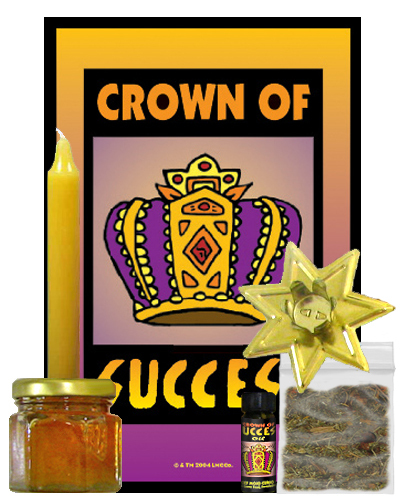 This week each lucky winner will receive a hand-made Lucky Mojo brand Crown of Success Honey Jar Spell Kit, complete with all ingredients and full instructions for use in hoodoo spells of romance, love, family, finance, business, school, career, sports, or the performing arts. If you can name it, you can succeed at it -- and a Crown of Success will be your award. First thing tomorrow morning, we will select THREE winners at random, announce their names here, and ask them to message this Facebook Page with their mailing addresses, so we can send them their FREE Crown of Success products. We have a winner! In fact, we have 3 lucky winners! Our Facebook Fridays! winners for May 18, 2018 are: Alyssa Hyphen Marie Fredrick, Jaime Banks, and Dave Schreck.